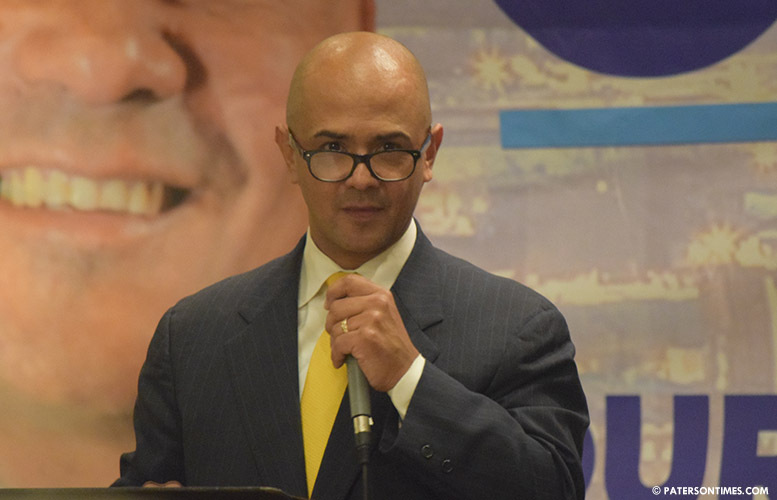 The municipal clerk cannot disqualify police union president Alex Cruz, who changed his voting address from Little Falls to Paterson last July failing to meet the one-year residency requirement, from the mayoral race, according to city officials. Passaic County superintendent of elections Sherine El-Abd has said Cruz may not be eligible to run for office in the city. She alerted municipal clerk Sonia Gordon of possible ineligible candidates in the developing race. “Once I check a voter and he is registered that’s it. I’m not denying anyone petitions,” said Gordon last Tuesday. “If he gets the required amount [of petitions], he is qualified.” She is relying on the opinion of law director Domenick Stampone. Stampone has argued the city clerk’s office is not equipped to conduct investigations. “She can utilize our office,” said El-Abd of the clerk last Wednesday. “She has to request it.” So far, no one has requested an investigation into Cruz’s residency. El-Abd said her office cannot open an investigation without receiving a complaint. She said any city voter can call, email, or visit her office to file a complaint and request an investigation into Cruz’s residency. Former school board member Pedro Rodriguez, who has alleged Cruz does not live in Paterson, indicated he has no plans to file a formal complaint with the superintendent’s office. Stampone argues in a letter to the New Jersey Attorney General’s Office that there are a number of factors that have to be relied upon to determine someone’s residency. Cruz’s voter address change could be one of those factors. Some of the other factors include utility bills, income tax mailing address, driver’s license, and school attended by children, according to Stampone’s letter. Cruz changed his driver’s license to a Pennsylvania Avenue residence in Paterson last July, according to government records. His campaign has vehemently asserted Cruz meets all “legal requirements” to run for office in Paterson. “Given that residency is not determined by any single factor alone, it is beyond the scope of review that a City Clerk is expected to conduct,” wrote Stampone. He wrote the letter in response to El-Abd’s email to the municipal clerk. The New Jersey Attorney General’s Office serve as the counsel for the county elections superintendent. “Issues such as residency are better dealt with by the Superior Court,” wrote Stampone. He said a candidate has seven days following certification to file a challenge with the New Jersey Superior Court. El-Abd has said the municipal clerk makes the call to disqualify a candidate. However, municipal officials suggested the city clerk may not have the authority to do so. “This is an issue for the Paterson Municipal Clerk. The Division of Elections does not oversee Municipal Elections,” said Jennifer Stringfellow, a spokeswoman for the New Jersey Secretary of State, on Friday. “We have no comment,” said Leland Moore, spokesman for the New Jersey Attorney General’s Office, when reached for comment on Friday. In the past, there have been ineligible candidates in Paterson elections. For example, in 2014, the Passaic County clerk disqualified school board candidate Khader “Ken” Abuassab, who was registered to vote in Paterson, but lived in Little Falls, following inquiries from the Paterson Times. El-Abd’s investigation found Abuassab was claiming domicile in a small office space by setting up a mattress on the floor. However, the county clerk does not have jurisdiction over municipal elections. The municipal clerk oversees city elections.